In Manchester the practise of fly tipping is becoming more common. Especially in suburban areas there seems to have been a huge surge of waste being dumped in alleys and other places literally overnight. The local councils have been finding it hard to cope with the demand within Manchester and therefore you end up waiting, in some cases weeks for your rubbish to be collected. 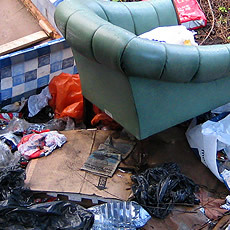 We can collect your rubbish a lot sooner than that... in some cases on the same day!